New-to-me food #27 was goji berries. I had high hopes. I love berries. 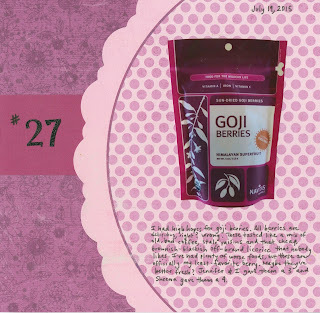 Unfortunately, it turns out that I do not love goji berries. At least not dried. They tasted like a combination of old coffee, stale raisins, and that really cheap, brownish-black, off-brand licorice. Not good. Not horrible, but definitely not anything I'd snack on. Jennifer and I both rated them a 3, while Sheena gave them a 4. I'd like to try fresh goji berries if I can find them to see if the old/stale taste was because these were dried and not a normal characteristic of the berry. Loving the page but bummer they didn't taste good!!!!! It's a lovely page. I'm surprised that they are not dried since they came in a resealable package. Oh gosh. Those don't sound like they taste good at all! These were sun-dried, right? Did they have a texture similar to raisins? I have never heard of them. I do like most berries though and would have guessed, like you, that they would be quite tasty! They were a little tougher than raisins. They weren't AWFUL, just not nearly as good as any other berry I've had.